Ethnic cleansing advocate Alan Dershowitz is not at all happy. He is devastated by the media and international community's failure to distinguish between the Israeli military and ‘Hamas terrorists’ (this is how he refers to Palestinian freedom fighters). Last week, Haaretz lent its pages to the Talmudic spin-meister – and I was delighted because Dershowitz’ arguments throw new light on the depths of Jewish ideological and political morbidity. “As Hamas continues to target Israeli civilians in their homes, Israel continues to target terrorist leaders and other legitimate military targets.” It seems that Dershowitz has found the magic formula that distinguishes between the ‘Jew’ and the ‘Goy’ in this conflict. The Jew is always a ‘civilian’ who happens to be a ‘victim’, while the dozens of babies, children and women murdered in the last week by Israel, they must have been ‘terrorist leaders’. Dershowitz argues that the Hamas policy is “designed to sow terror among the Israeli population.” This is a peculiar argument. Due to its limited means, Hamas is confined to the use of primitive rockets. If Hamas had cruise missiles at its disposal and still used them to target civilians, then I would be the first to agree with Dershowitz and even support his argument. But the contrary is true: It is the IDF that possesses the most sophisticated weaponry and is capable of targeting military targets with precise, even astonishing accuracy. So, with that in mind, every Palestinian civilian casualty caused by the Jewish state must be counted as an Israeli attempt at massacre and therefore, nothing short of a vile war crime. Dershowitz justifies Israeli barbarism by pointing at Article 51 of the United Nations Charter that clearly refers to the ‘right of self-defence’. But the Harvard spin-doctor forgot to mention that the Gazans are actually living under Israeli occupation in IDF-controlled concentration camps. As such, it is the people of Gaza’s right to resist that is clearly protected by International Law. I have proved on numerous times, the Jewish ethnic campaigner Dershowitz is no Jewish sage and his advocacy of mass murder is very problematic. Dershowitz clumsily falls into traps he himself foolishly sets. “What would Egypt do if Hamas or Islamic Jihad suddenly began to lob deadly shells in the direction of Cairo suburbs? What would any country do?” says this Zionist mouthpiece. Let’s just examine his Hasbara logic. Would Dershowitz be similarly outraged if he had found that, back in the Spring of 1944 a bunch of heroic, militant Jewish, Auschwitz inmates had managed to launch a few long rage missiles towards Berlin? Would Dershowitz see them as ‘war criminals’ attempting to murder German civilians? Would Dershowitz support Hitler’s decision to unleash his wrath against those Jewish inmates and their ‘terrorist’ militant leaders? No he would not because Dershowitz’ tribal ethics are, above all, flexible - he fiddles around with his arguments hoping that no one will read him carefully enough to notice. 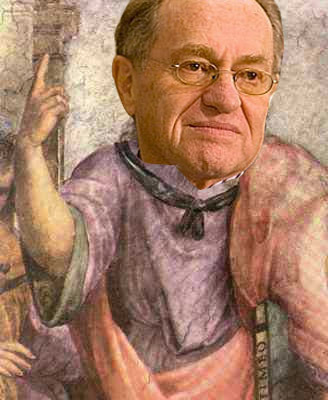 “There are some who argue”, says Dershowitz, “that all targeted assassination is unlawful, since it constitutes ‘extrajudicial killing.’ But all military deaths are extrajudicial killings, as are deaths caused in the civilian context by individual acts of self-defense or by the police shooting a dangerous fleeing felon.” Someone should remind dear old Dershowitz that Palestinian militants are living and operating within an Israel-controlled open air prison. This means that the IDF is operating as a police force and its first duty is to attempt to bring the so-called ‘criminals’ to trial. The attempt to equate Hamas leaders with ‘fleeing felons’ is pathetic, for Hamas was democratically elected by the Palestinian people. Furthermore, neither Israel nor USA, Britain or any state I can think of would deploy a F16 against any ‘fleeing felons’. If Israel really insists on exercising its judicial power, it should send police forces into Gaza to capture those it regards as threat – and then charge them in court. “Israel’s response to the Hamas rockets must of course be proportional, but proportionality does not require that Israel wait until a large number of its civilians are actually killed or seriously injured. Israel’s response must be proportionate to the threat faced by its civilian population.” Thus Dershowitz manages to empty the notion of proportionality of any meaning at all. Would Dershowitz also argue that we equally pursue the leaders of AIPAC for pushing America into war with Iran? Clearly, such a conflict could escalate into world war, should we wait until a large proportion of humanity is reduced into dust? “It is the obligation of every sovereign state, first and foremost, to protect its civilian population from terrorist attacks.” parrots Dershowitz, but I thought that, according to the Geneva Convention, an occupying force is responsible for the protection of the civilian population living within the occupied territory. Israel starves, abuses and, when it deems it necessary, murders its occupied population. Israel is obviously a criminal state, its leaders are war criminals and their enthusiastic advocate Dershowitz is the ultimate embodiment of Zionist filth. The fact that Dershowitz holds a podium in Harvard is just one more manifestation of the devastating transformation of American academia into just one extended Yeshiva.